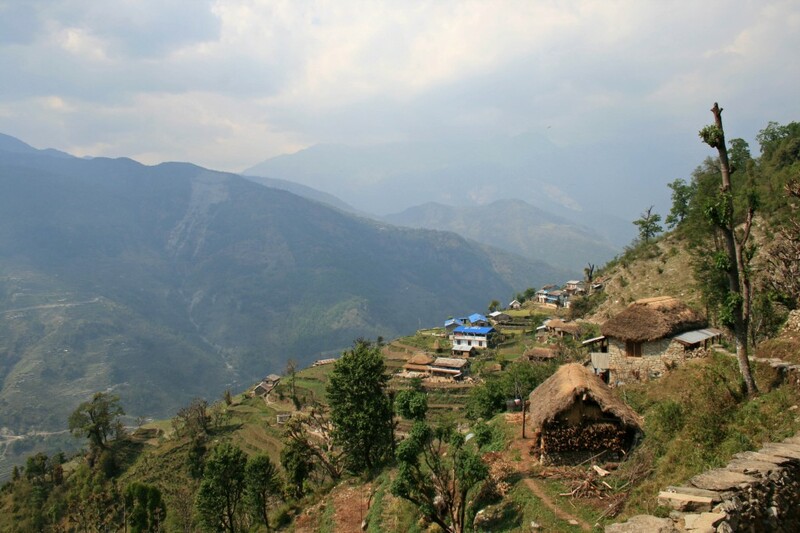 Our plans to hike to Everest Base Camp were completely hijacked by fog that had settled into Lukla and the Nepali domestic airport’s complete lack of organization. We spent an entire day sitting in the domestic airport gorging ourselves on Snickers bars and Pringles, while we waited for the airline to decide whether there would be any more flights going out that day. We were even considering canceling our tickets and joining up with some others to charter a helicopter. Thankfully we didn’t go that route!!! But we learned a valuable lesson that day and it is this: If your flight is not the first or second flight of the day it will not go!!! No ifs, ands, or buts about it. Don’t be hopeful, don’t let some stressed out fool try to convince you to pay $400 per person, for a helicopter ride. It’s not going to happen, so book the first flight of the day. End of story!!!! 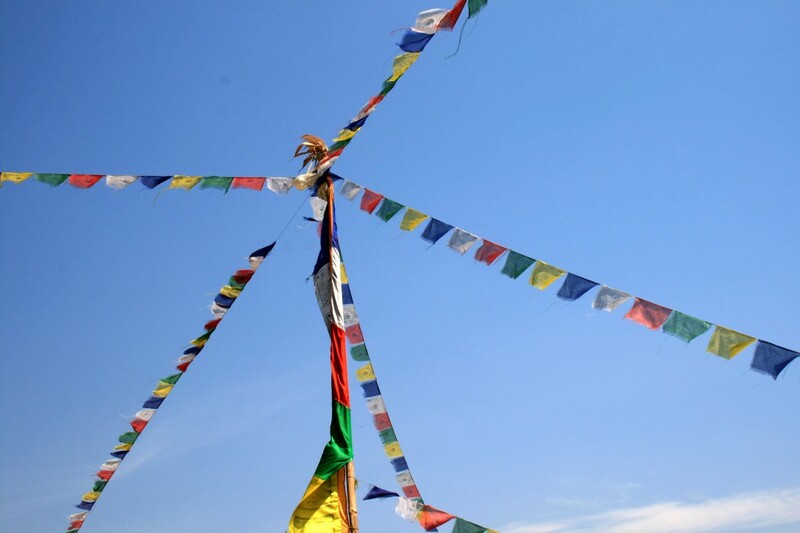 We luckily had a fairly flexible schedule, with 6 full weeks allotted for Nepal alone, so after a full day of sitting on the concrete floor of the domestic airport, we decided to cancel our flight and rebook it for a few weeks later. We weren’t going to accept anything, but the first flight of the day!!!! 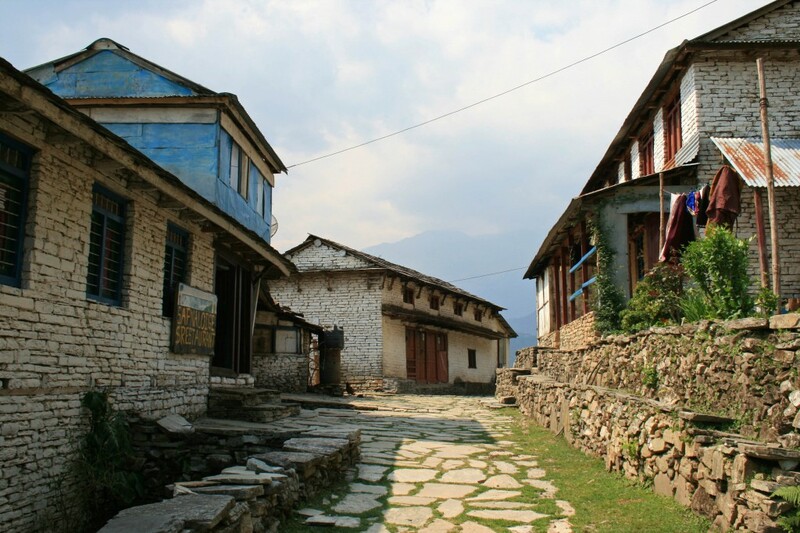 With the Everest Base Camp fiasco solved, we decided to head over to Pokhara and the nearest large town to the trailhead for Annapurna Base Camp. 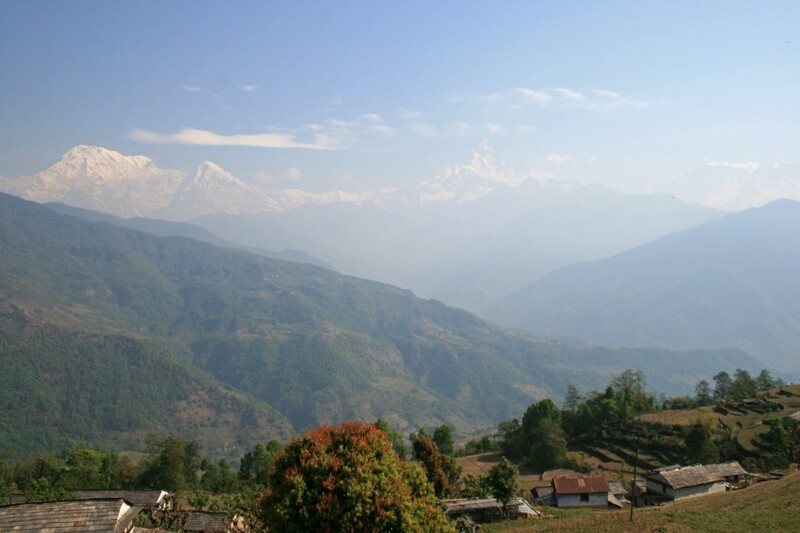 We had been planning on doing the Annapurna Sanctuary trek anyway, so we were perfectly okay with the change of plans. 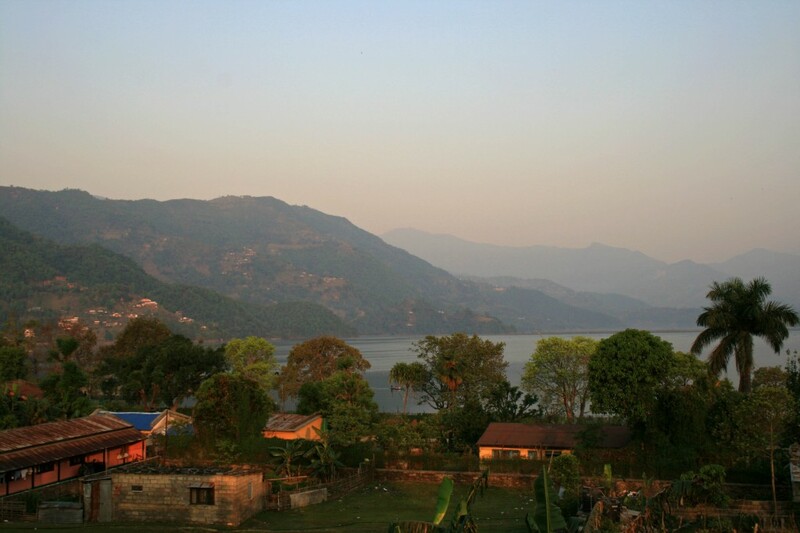 The view from the top of our guesthouse in Pokhara. 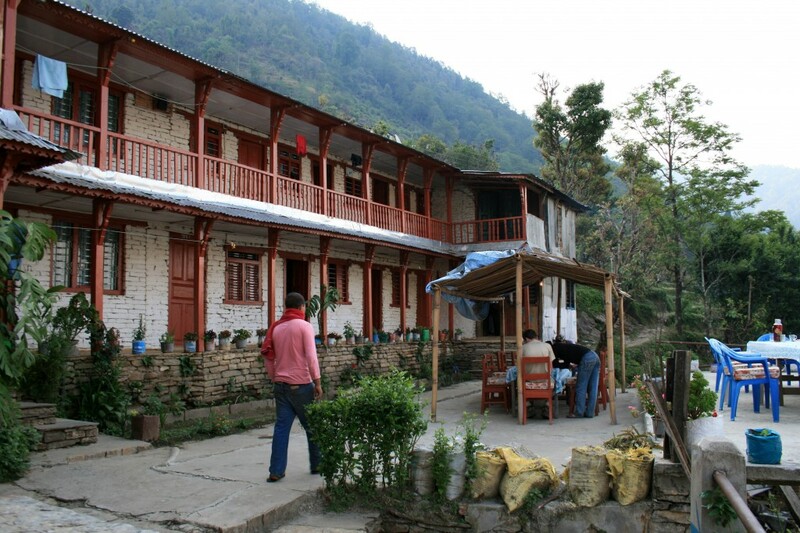 We gave ourselves 9 days to do the whole trek, 8 would have been plenty, but having the 9th day meant that we could spend an entire day soaking in the hotsprings at Jhinudanda and stuffing our faces with momos. 1) “There it ain’t”- referring to the next town, which would always be down the valley and up the other side. The views on this trip were seriously epic and totally worth every step….some of the sets of stairs I can still remember every single detail. 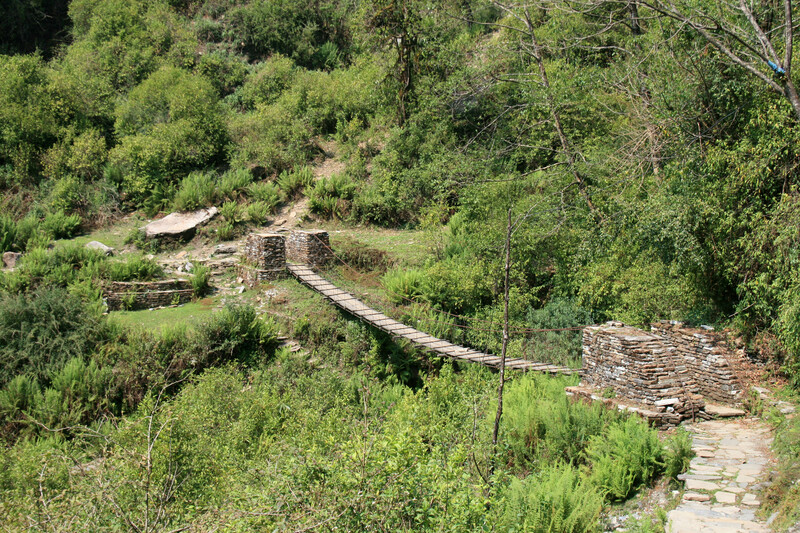 Bhichok (Pitam) Deurali: 2100 m.
The trail begins with a set of stairs. You’ve been warned…. we were warned. There will be lots of stairs and you will learn to love them, actually you’ll probably never love them, but think about all of that booty firming that is going on. But it’s not all stairs (I promise); the trail meanders through farm land, and practically goes through people’s yards as it makes it’s way up the hill. 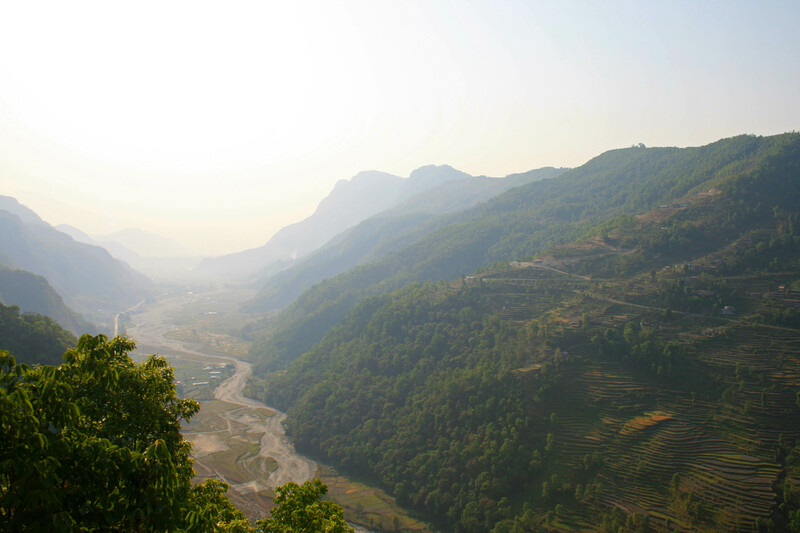 Looking down the valley from Phedi….the haze was incredibly thick until we got up above Dhampus. You will have views of the valley and river below, but you won’t be able to see the mountains, well atleast we couldn’t. 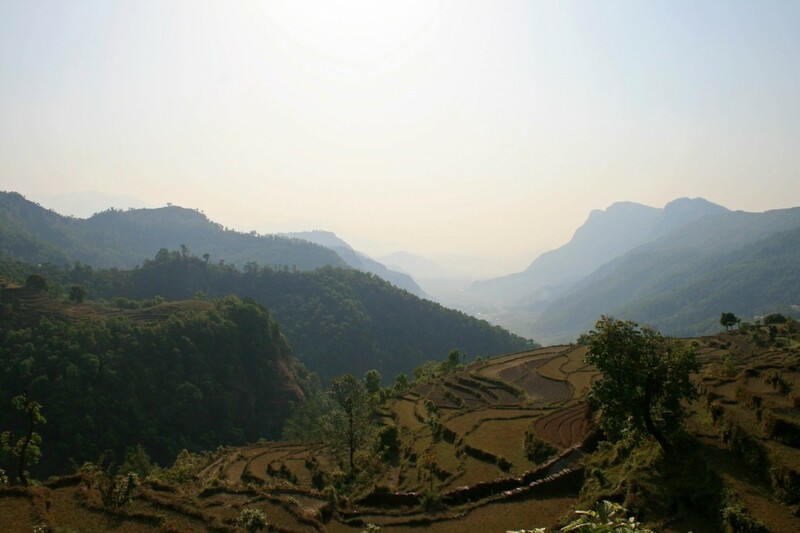 The valley at this elevation is still very hazy, as are most of the valleys in Nepal. But when you get up high enough, which doesn’t take long, you will be rewarded with view after view of mountains, valleys and farmland. Our first glimpse of the Himalayas from the roof of one of the restaurants!!! After an hour or so on the ” stair climber” we reached Dhampus. 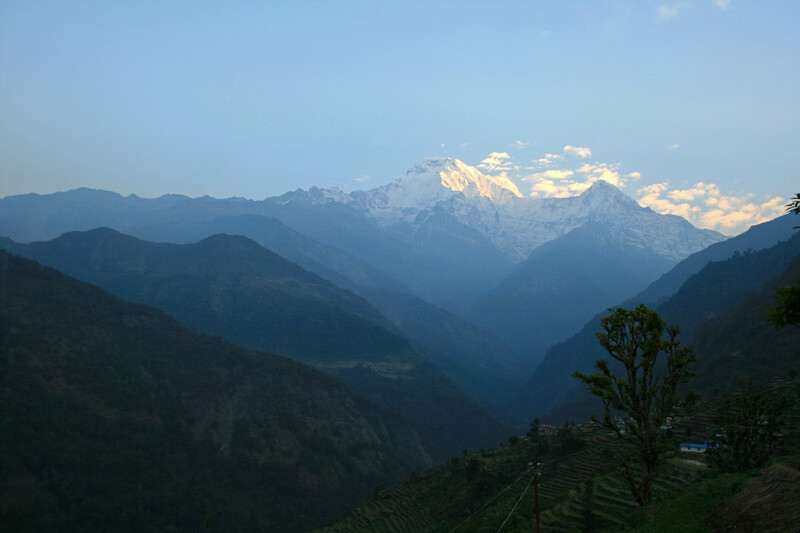 We totally weren’t expecting to see the Himalayas from Dhampus, but we were pleasantly surprised to Annapurna, Fish Tail and the others. What a reward for tackling the first major hill and set of stairs!!! First set of stairs complete!!! 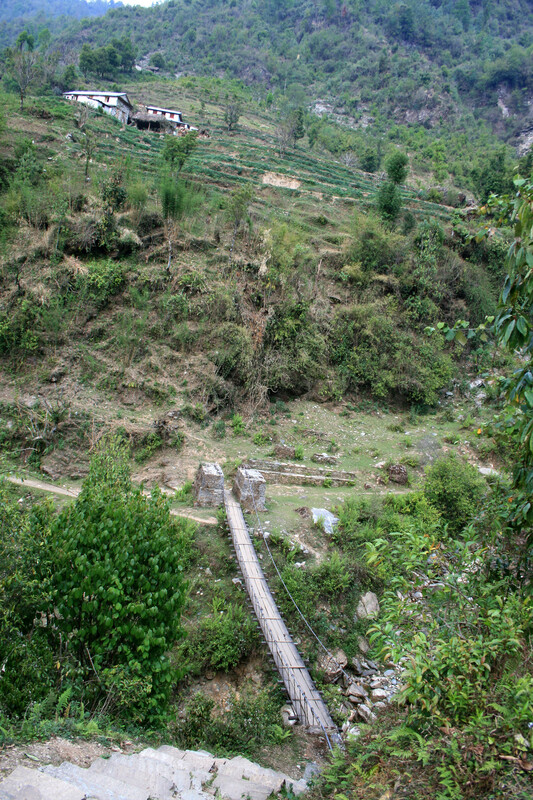 From Dhampus to Landruk the trail goes over the pass at Bichok (Pitam) Deurali at 2100 m and then descends all the way back down to Landruk at 1565 m., which (you’ll love this) is lower than Dhampus….hah, of course. 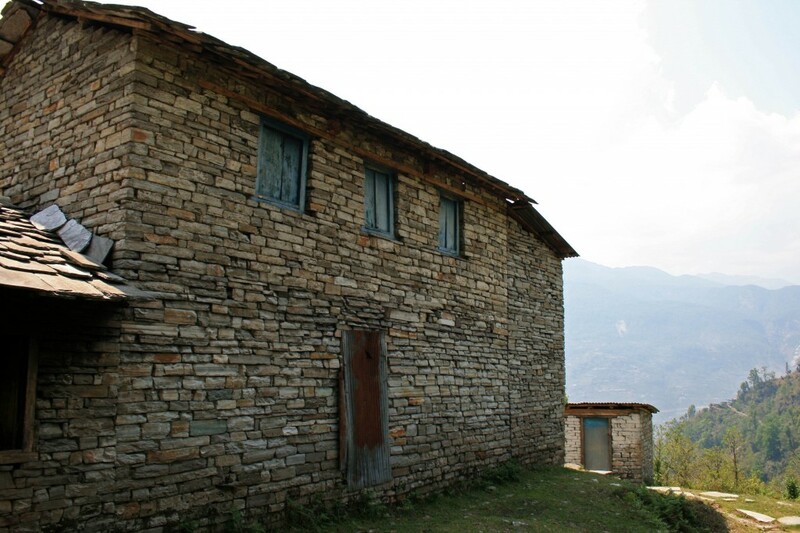 We also started using the phrase “Nepali flat,” which is never actually flat. To enter the sanctuary you have to get your TIMS card checked in Pothana (maybe 4 km after Dhampus), so make sure you stop. They will check it again at Nayapul on the way out. 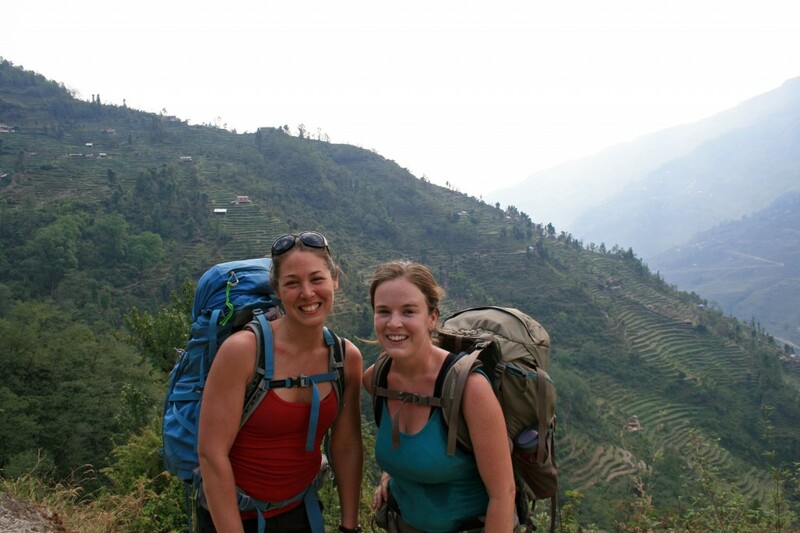 We learned early on that there is a ton of elevation change on every single day of the trek. No matter where you are (except up at the base camps) the trail has continual steep ascents and descents. Thankfully half of the time you’re gawking at the views, so it doesn’t seem quite as treacherous. Angie and Steve ham it up…. I’m pretty sure I have atleast twenty pics of these guys, but I’ll only subject you only to these two. We arrived at our guesthouse early afternoon and the clouds had already started to descend into the valley, so we had no idea how majestic the view would be in the morning. It was warm enough for us to enjoy all of our meals outside on the terrace and enjoy the fresh mountain air. 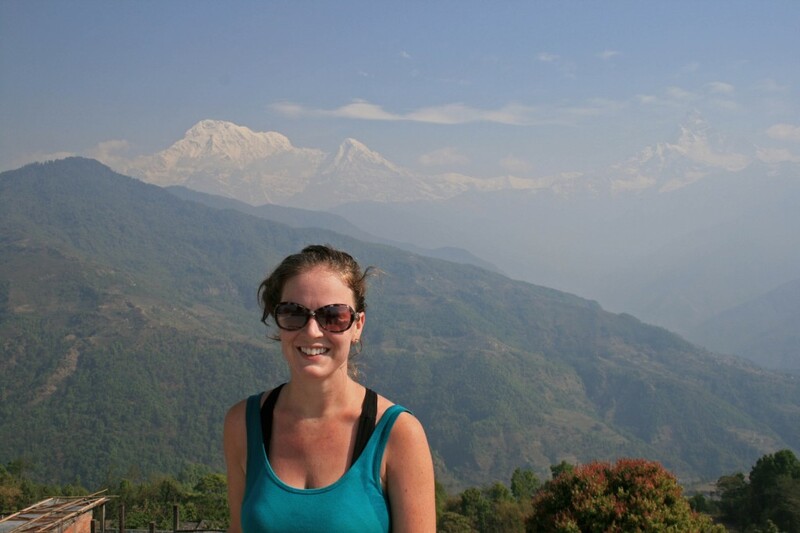 After being stuck in Kathmandu and Pokhara for nearly a week we were loving the smell of the trees and smog-free air. Epic sunrise on Day 2. 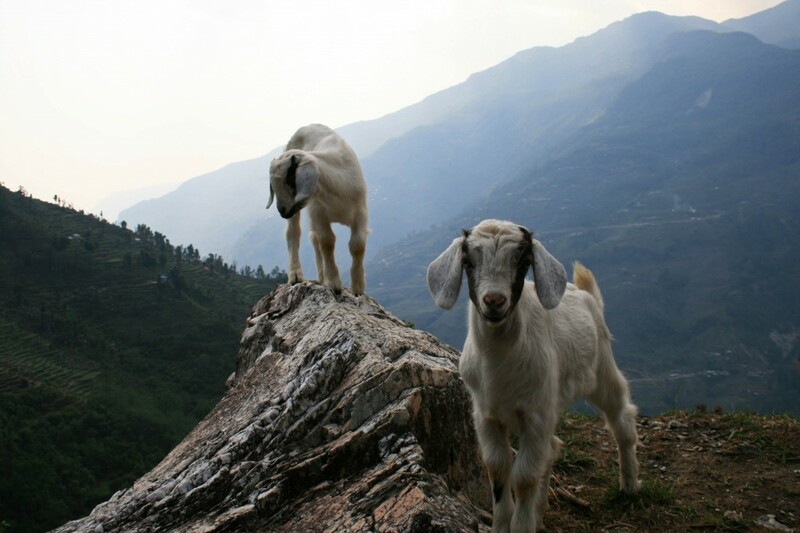 Hello Himalayas!!! For the next 8 days we hiked up and down and criss-crossed this valley so many times it’s easy to lose track. 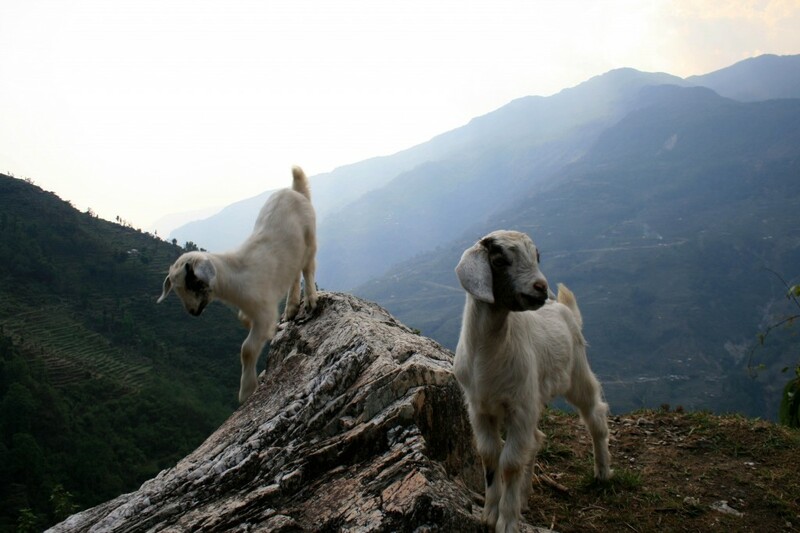 This entry was posted in Travel and tagged Annapurna Base Camp, Annapurna Sanctuary, Deurali pass, Dhampus, Landruk, nepal, Phedi, Pokhara, trek by autumnadams4. Bookmark the permalink.